Email subscribers get free access to my #GYFLT Worksheet, which includes my 5 step plan to get you feeling more in control of your finances. Around the time I stopped sucking my thumb I developed another bad habit. I became a hoarder. Not the kind you see on that heinous reality show with newspapers dating back to the early 1900s or unidentifiable substances in discolored mason jars. Arguably, my hoarding was worse. I loved stashing away money. At seven years old, I started hiding money in a tin can that still kind of smelled like Hershey Kisses and Reese’s Pieces — perhaps that’s why I have such a positive association with money. Back then I decided to save up for a red Mitsubishi Eclipse. Say what you want, but I thought that car was the coolest. I believed I could save up enough pet-sitting and Krispy-Kreme-doughnut-sales money to purchase my first car by sixteen when I could get my driver’s license. Hey, at least I didn’t expect my parents were going to be buying me a car. Pushing fast forward — that never happened because my family moved overseas and I didn’t get my driver’s license until I went off to college — but the hoarding habit lingered. My little hoarding habit didn’t get much better in college. As a resident assistant I started making the big bucks. $6,000 a year! We were paid in six stipends of $1,000 — three per semester. I lived a pretty minimalist lifestyle and my only big expenses were gas and car insurance (sadly, I was not driving a red Eclipse). I carried on my hoarding ways and started tucking away 50% of each paycheck into savings. I had big plans to move to New York City after college and this nest egg would help finance my independence. By now you’re thinking that I’m a financial goddess and clearly have never made a poor money-related choice in my entire life. Except, I didn’t put it into my own savings account. I asked my Dad to transfer $500 per paycheck into his account. He kept an incredibly detailed spreadsheet showing exactly how much of my money he was holding. My rationale for this method was that I’d have to ask him to transfer money back to me if I wanted to make a big purchase. He never questioned it if I wanted my money, but it gave me a mental checks-and-balance system so it became difficult to buy expensive items on impulse. Yes, my Dad’s saving account did accrue interest and he kindly credited me with the amount my money earned. My big mistake came when I graduated from college and started to funnel some of that savings back into my own account. I PUT IT IN CHECKING! Not only did I put that money in checking, but I held it there for an embarrassingly long time. I didn’t open my own savings account until about a year ago, around the same time I started investing money in places other than a 401(k). Even sadder, it wasn’t even a thought that I had proactively. A financial advisor with my bank had to nudge me in the right direction. I started the process of putting some money into a mutual fund when the advisor nonchalantly asked why I didn’t have a savings account? Moments later I had a savings account all set up. A completely painless and incredibly quick process that would’ve taken me all of 10 minutes to set up at any point in the two years since I’d started taking ownership of my savings. We all have moments when we realize we’ve mishandled our money. That’s part of the reason financial education is so important. 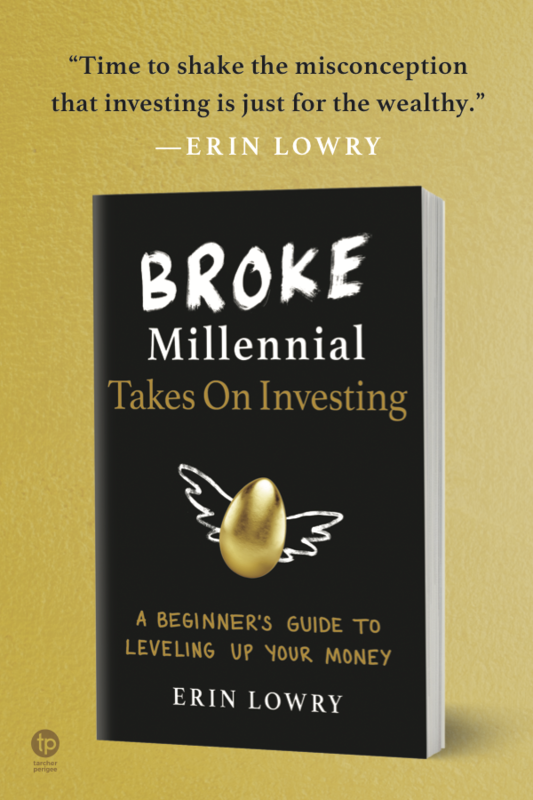 You don’t stop learning about money simply because you amass a certain amount of wealth or happen to make some great decisions regarding your investments. Financial literacy is an ongoing, life-long process. I have no doubt I’ll make other financial mistakes in my future, but I hope to learn from them and become better at handling my assets. Fiscal responsibility is one of the only ways to become truly independent. That or give up all earthly possessions and become Plays With Squirrels. What was your biggest money “a-ha” moment or mistake? Fill out the form below to never miss another. You'll also get a free money worksheet. There are so many simple money related habits we don’t do for whatever reason. Mine was not following our budget. We would make one but then not follow it. What kind of sense is that? I eventually realized how silly that was but only after some painful experiences. I so get that. I use to make budgets that never worked because they were too optimistic or inflexible. Budgets have to be realistic and roll with the punches. Not till I realised that they could and should be constantly tweaked as need be did I get any traction. I should probably be more rigid about budgeting than I am. But once I have a family and/or debt (aka a mortgage) it might be a wake up call. It’s the coolest car! My first car ended up being a Rav4 though and I loved it so much. Honestly, I’d had that checking account since I was a kid so I probably didn’t know any better at the time. Glad I do now! I technically had a savings account for years but kept everything in my checking account. I finally opened one a couple years ago and it’s been a good place to put money that I only will touch in an emergency. My bank has a little emergency fund tracker widget that increases a little red line towards my goal as I deposit money into my savings account. It seems silly, but it’s a solid motivator. That is the silver lining! I thought I was the only one! My parents helped me set up a checking account when I was in middle school, and that’s where I always deposited my babysitting and tutoring money in middle school and high school. It wasn’t until college (late college. Almost ready-to-graduate college) that I realized I didn’t actually have a savings account. Weirdly, I did have a Roth IRA. Hey – you were ahead of me on that one. I should’ve started a Roth IRA way sooner! I would much rather see a person have an “issue with saving” and not saving smartly than the opposite. Your hoarding days were actually the building of a foundation of frugality that has allowed you to accomplish so many of your life goals without a massive salary. Congrats! Thanks, Shannon! I do agree that I’d rather be a saver than a spender. Helped in the long run. I’ve noticed that online banks have more exciting interest rates than brick-and-mortar (that still being relative) which makes me inclined to switch my savings account to an Ally Bank or something similar. That’s awesome you were a saver at such an early age! I was quite the opposite in pretty much always being a spender – which is what got me in trouble. Thanks, John. I wish there were a way to find out if it was a nature vs. nurture thing. Both my little sister and I are pretty into saving. I think you inadvertently found a way we can increase the savings rate in the world – we hoard money in jars that smell of chocolate. Who could resist saving? LOL! It doesn’t surprise me that you were a money hoarder, which is frankly better than being an out-of-control money spender. 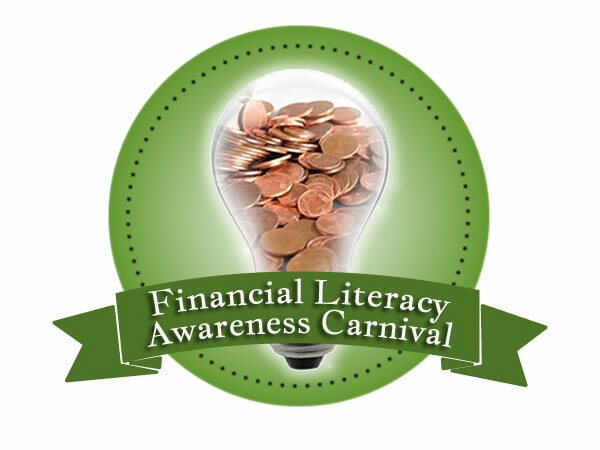 Thanks for participating in the Financial Literacy Awareness Carnival – I truly appreciate it and your support! I was happy to be invited! I think we should take the idea of a candy smelling piggy bank onto Shark Tank. It’ll make millions! I know so many people who keep ALL their money in checking earning .01%. Blows my mind! I’ve been harping on some of my friends to move their money into savings. Get more than a penny a year! 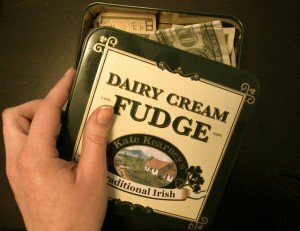 That’s so funny about the chocolate tins, but I agree it would be a good association process to stash money in there (at least for chocolate addicts like myself). I’ve always been impressed with your level of financial competency, especially with starting a savings account and 401k so early in your life – even if it took a few years, I feel you’ve done it way earlier than most and that’s something to be proud of! Awww, thanks Anna! That’s really nice of you to say. I hope it pays off in 30 years so I can retire on a “fat stacks” as Jesse Pinkman would say. LOL, on the whole Mitsubishi Eclipse thing 🙂 I had a friend in college who had an older model, and I loved her car. I thought it was so cool! I was a little worried to mention my love of that car for fear of torment, but it seems like everyone else loved it too! We made a mistake a few years ago in a similar way. We wanted to put some money into a savings account for a particular purpose. We would not need the money for five years. I’d researched rates and found a good one on a savings account at ING (rates were higher back then). My husband put it into a CD at our credit union at a much lower rate. He didn’t discuss it with me. That’s when I knew I had to communicate with him about our finances on a regular basis. We now do that and I’m much happier about our finances! Openness about finance seems to be the key to marital bliss. I’m not in the position yet myself, but hope I’d pick a partner that I too can have frank conversations with. Your joking, red Mitsubishi Eclipse was MY dream when i was working after college. AND i keep all my money from relative gifts since i was a child until i finished college to buy an Xbox360. You sound a lot like me hehe. Retirement plans for dummies? 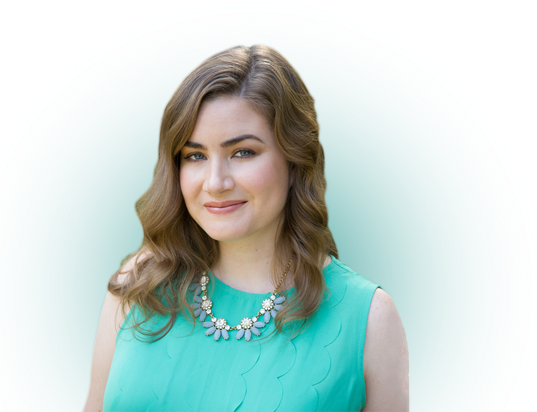 like what she said “Financial literacy is an ongoing, life-long process.” Keep on reading blogs from her or blogs like these. Thanks so much, Jeff. Very kind words! I guess hoarding money is a little better than hoarding discolored liquids. Sometimes it takes a little nudge from the unlikeliest of people (a bank employee looking out for a customer??) to get the right thing done. I’m thinking with everything so easy to do online nowadays, it will be easier for young people to eventually open good savings accounts and learn about finances. A friend of mine had a similar experience. She had A LOT sitting in checking and her bank teller mentioned that she might want to dump some into savings. Nice that some bank employees are looking out for us. I probably would’ve been reluctant too. I liked have access to my money — well I still do! A checking account is better than under a mattress or just keeping cash in the house in general! 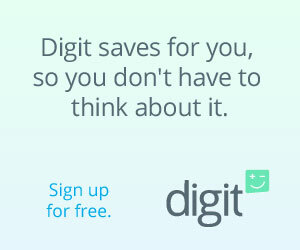 At least you wouldn’t have to worry about fire, theft, or floods from taking away your money. WHAT?! I didn’t know Coinstar did free exchanges for Amazon gift cards. MIND BLOWN! Of all the accounts not to have, I figure the savings account, at least with the interest they’re paying these days, isn’t going to hurt you that much. I was so glad to see you have a 401k! Not using that account will have much bigger impacts. I couldn’t wait to sign up for a 401(k) but now I’m in the annoying process of rolling my old one out into an IRA. At least I get one with my new company too! I think you’re doing pretty good if that’s one of your biggest money mistakes – especially with savings account interest rates what they are. But like anything else, at least once you realized your mistake, you fixed it. Also, I LOVE that gif. Haha, thanks! I had a good time finding that gif. Boy Meets World meme….you’re my new favorite. And at least you were saving! Interest would have been nice, but I can tell you there were points in my life where I had no savings at all…under my mattress, in a bank, or otherwise. Boy Meets World will always be relevant and awesome! Very good post also educational and all this is even better that comes from your experience. If are right some philosophers that if you read and learned you may forget but if you try it/experience it you will never forget that. There are many people, also from my family and close friends that don’t care or spend time to learn some basic financial thinks. Don’t calculate how will affect spending, buying or investment on them in the future. This sometimes really worries me and want they to have at least some financial education before they are stuck. Thanks, Tamara. Hopefully you can lead by example and your friends and family will follow. Inertia is a good excuse when we tend to not do things we should. Well perhaps I’ll use that one next time! I guess I’ll be investing in mutual funds then. Honestly, the inverse happened to me. I used to keep all my money in a savings account. But then I learned about the magic of high interest checking (3.01%) and never looked back. Overall great post always love reading them. It’s time to get your financial life together! Email subscribers get free access to my #GYFLT Worksheet, which includes my 5 step plan to get you feeling more in control of your finances. It doesn’t need to be terrifying. It just needs to get done.